The United Way encourages the in-built efficiency of one organization seeking funds on behalf of a group of charitable agencies. As a consequence, we promote the idea that giving is through the United Way, rather than to the United Way. 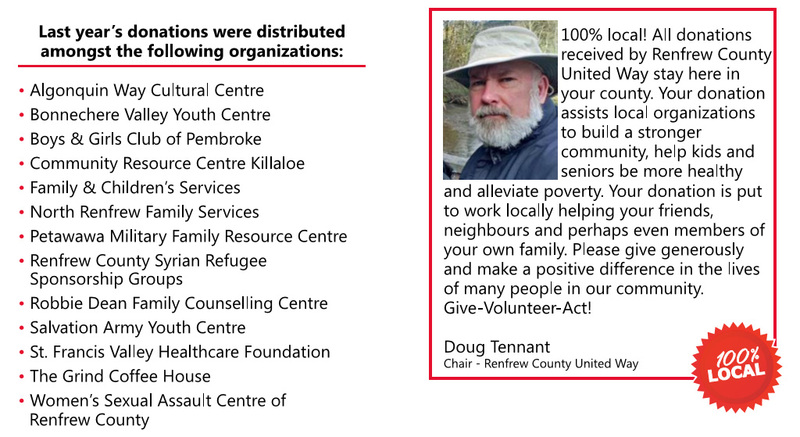 Donations received by Renfrew County United Way (RCUW) stay in Renfrew County to support a variety of health and social programs. Funds designated by donors to registered charitable organizations outside of our region are the only exception. An administrative fee is levied on all designated donations. Although RCUW undertakes campaign activities year-round, the September through November Campaign Blitz period generates the bulk of the funds raised. A campaign goal draws attention to the level of donor support sought and the level of volunteer involvement required to achieve it.